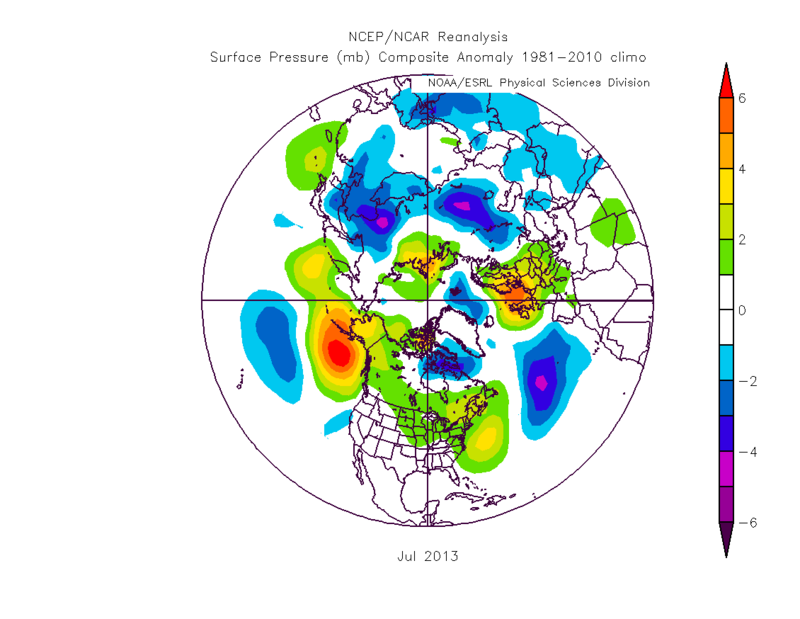 NCEP/NCAR Reanalysis data for July is now available, so it is possible to assess what the atmospheric state has been in July, and for the summer so far. The atmospheric state in 2013 continues to be remarkable in the context of the other post 2007 years, and this is clearly the proximate cause of the slow melt season seen in 2013. 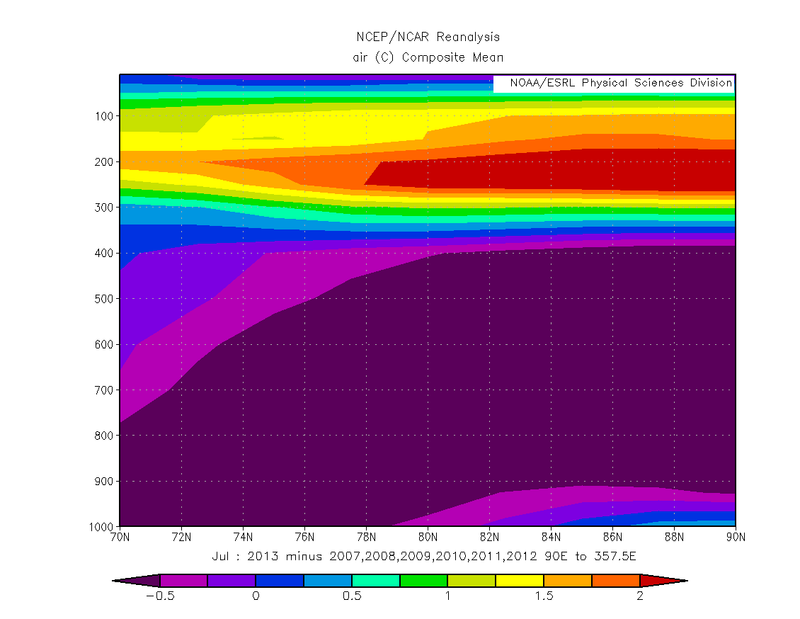 Sea level pressure (SLP) for July 2013 is shown below. 2013 is seen to be markedly different from the post 2007 average which is shown in the plot below. The pattern shown above is a new pattern in the summer average of pressure, consisting of a high over Greenland and much of the Arctic Ocean, with a halo of lows surrounding. I suspect that the Greenland high is inducing the wider low pressure halo, the high itself is caused by a ridge in the atmosphere over Greenland. 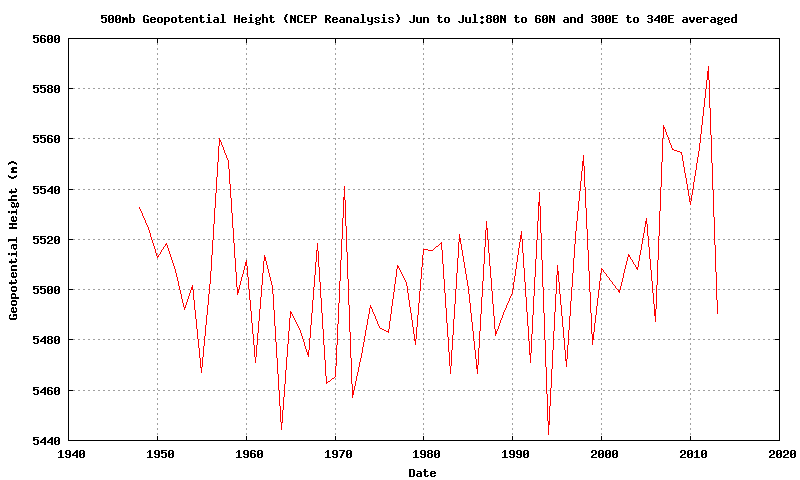 Geopotential height (GPH) is the height at which a certain pressure level is found, the following two graphs show the height of the 500mb pressure level in July and for June and July, from 1948 to 2013. It is clear that GPH over Greenland is very low in the context of the other post 2007 years. 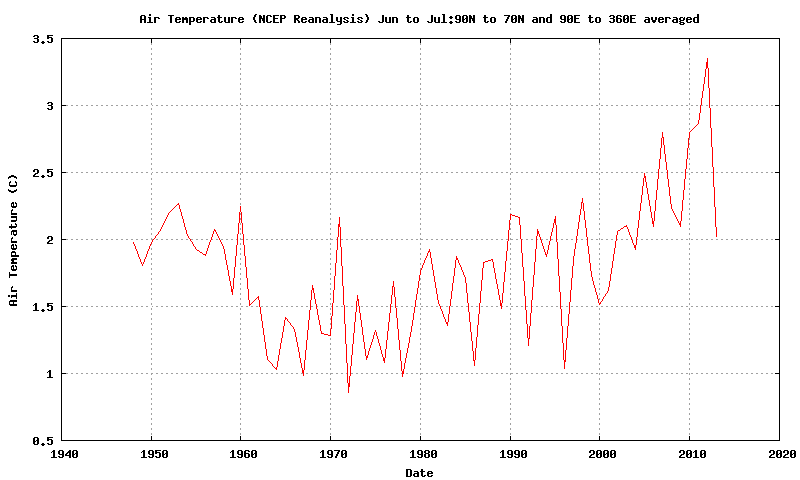 Note that July 2010 is the only summer (JJA) month in which the summer pattern did not appear, aside from this summer. Aside from wider Arctic impacts, the lack of an unusually large Greenland GPH ridge this year should mean that Greenland mass balance loss for 2013 will not be exceptional, Hanna et al, 2012, "The influence of North Atlantic atmospheric and oceanic forcing effects on 1900–2010 Greenland summer climate and ice melt/runoff." Abstract. 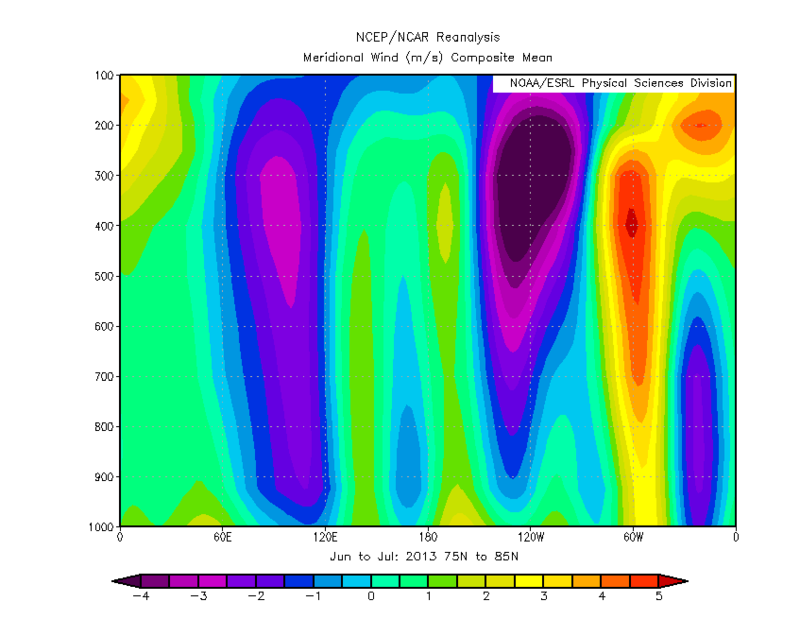 The summer pattern gives rise to a dipole pattern which draws air from the Pacific to the Atlantic. This can be seen in meridional air flow. 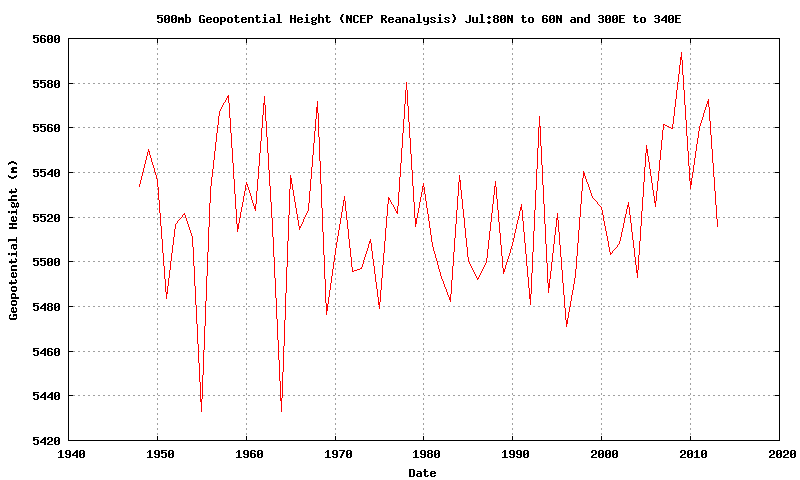 The following plots are generated from NCEP/NCAR by defining a band around the pole from 75degN to 85degN. Air flowing northwards through that band is indicated as a positive number (reds), air flowing southwards is indicated as a negative number (blues). 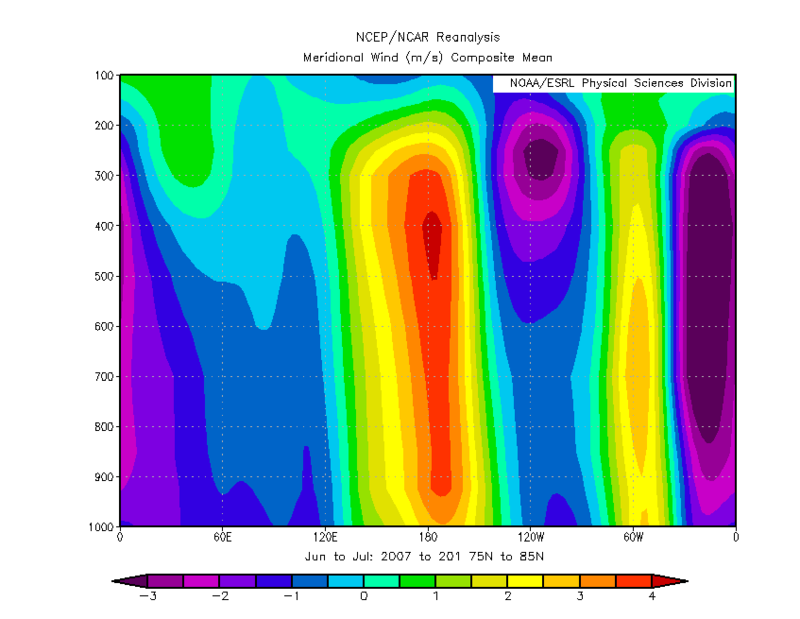 For June and July 2007 to 2012 around the anti-meridion (180 degrees) is seen a substantial, vigorous, and deep (surface to 200mb height) air flow from the Chukchi Sea poleward, this is the warm air influx due to the Arctic Dipole. 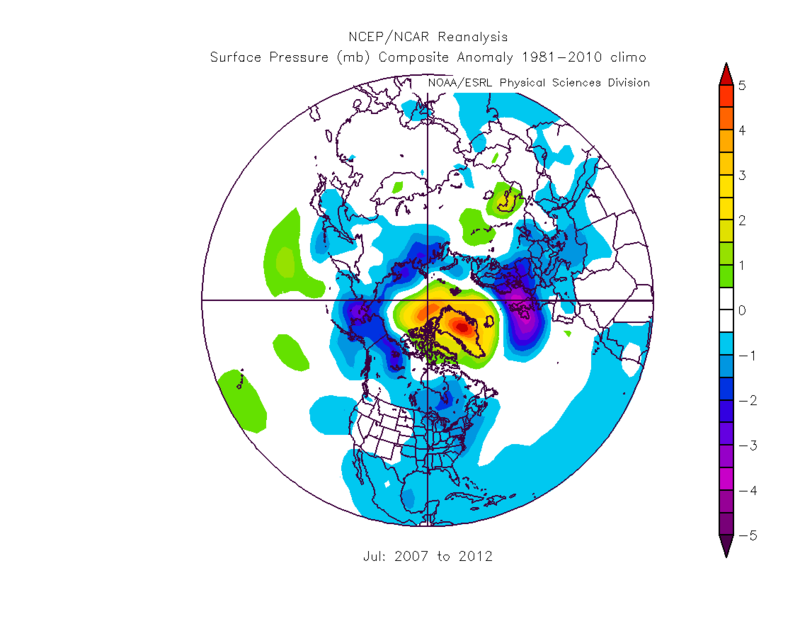 Referring back to the second graphic of this post (SLP for June and July 2007 to 2012) it can be seen that this is a result of the interplay between low and high pressure over the Russian sector of the Arctic. Low pressures circulate anti-clockwise, high pressures clockwise, resulting in the net airflow from Pacific to Atlantic. To the left of the red/yellow inflow at 180degN is air flow towards Russia, this is seen to be away from the pole, and intensifies towards the left of the plot, the Greenwich Meridion. 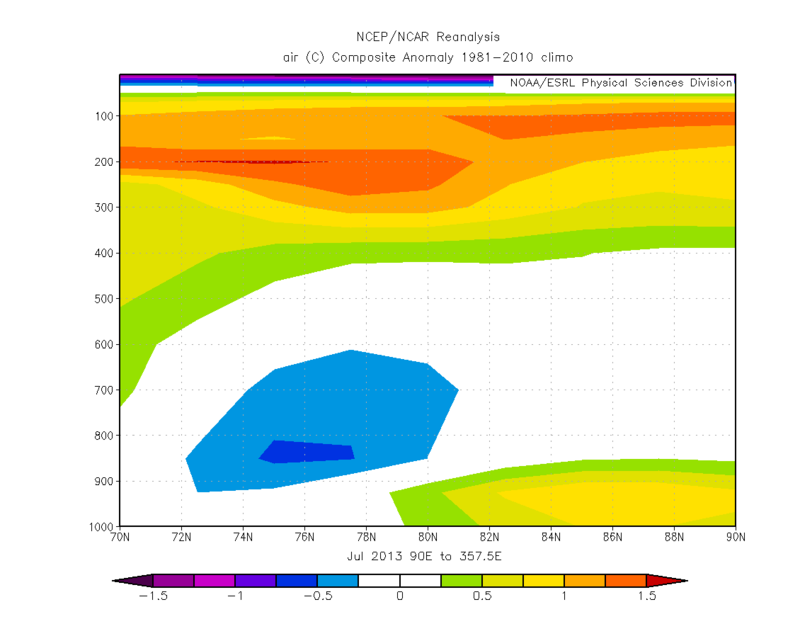 This is the net outflow of the Arctic Dipole. Also visible to the right of the plot is the large airflow away from the pole due to the clockwise movement of air around the central Arctic / Greenland high. Around 60degW is the poleward airflow on the Canadian side of Greenland. The poleward airflow around 180degN is seen to be far more muted, as is the airflow to the right of the plot around Greenland. This lack of inward airflow has made the Arctic atmosphere colder in 2013. 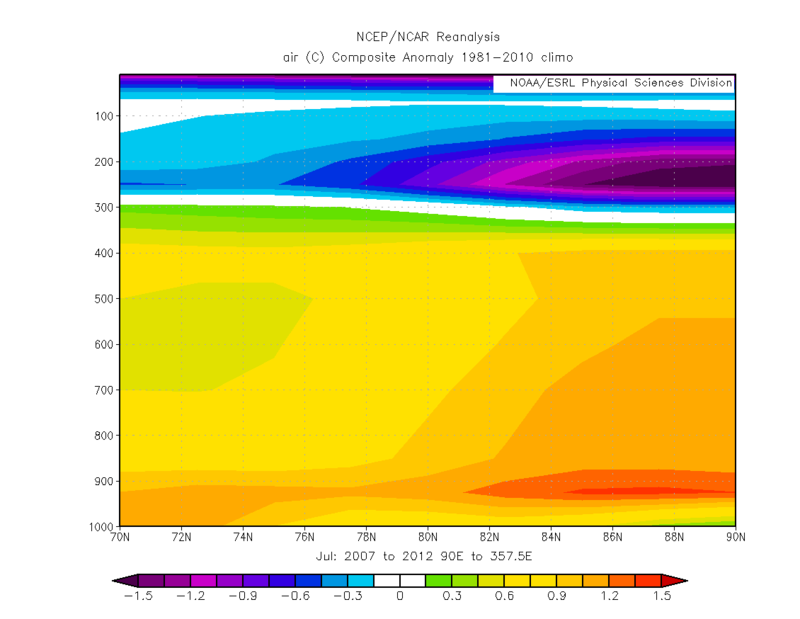 The 2013 atmospheric profile lacks this warmer atmosphere, showing a warming aloft, but a mid tropospheric region of climatologically near-normal temperatures. And here is the difference between 2013 and the 2007 to 2012 years, which shows that while the cooling is not massive, it is nonetheless clear. This lack of warm air influx has affected temperatures at the surface in both July and the June/July average, here for the region north of 70degN. 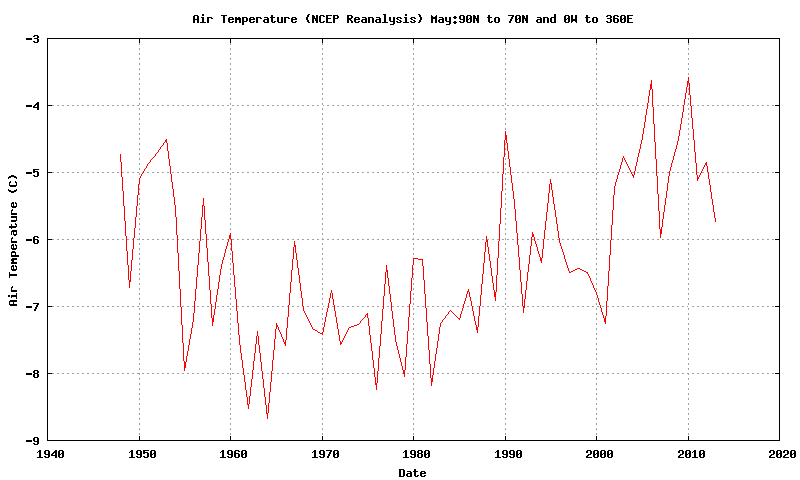 There has been a warming in recent years, and so far 2013 represents a downward excursion from that trend. GFS forecasts suggest that for the first week of August this will continue to be the case. The lack of a strong Arctic Dipole this year has had a clear retarding impact on the sea ice melt season. This is the proximate cause of the slow melt season this year, the ultimate cause is that cause of this year's atmospheric set up and the failure of the post 2007 summer atmospheric pattern. Workload allowing I will start looking at that seriously over the coming month. Given that since 2007 all summer months (JJA), except July 2010, have displayed the summer pattern and anomalous Greenland GPH ridge, it is reasonable to view the failure of this year's summer pattern to be a one off, and to expect the summer pattern to be a factor in future summers. So far it seems that cold temperatures in May, link, have played a role in retarding the melt season, which has then had knock on effects throughout the rest of the summer, making this year seem more like a pre-2007 melt season. Given the 2007 and 2010 volume loss events, and the additional loss of volume in the intervening years, 2013 only seems on a shallow view of numbers like a pre-2007 melt season. The reality is that this year will not save the pack, it is very likely little more than a one year pause, and it is still feasible that August could see CT Area approach levels similar to 2007 or 2011. For these reasons I take people talking up a recovery as seriously as I take those claiming this September will see 2013 beat 2012. And I take both sets of people as seriously as I took those who said the world would end in December 2012. 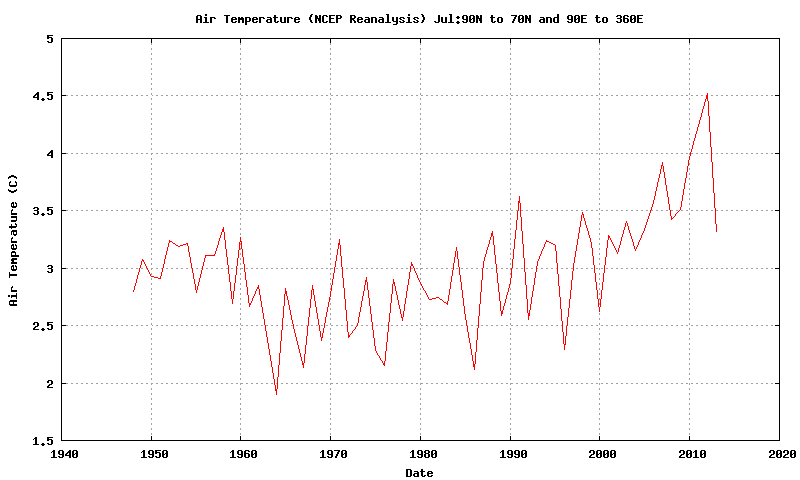 It would be interesting to plot the "coldness" of an arctic summer against final (september) extent/area/volume. It would probably show that this cold arctic summer resulted in massive ice loss nonetheless. Yes even relatively cold summers have massive ice loss. When the PIOMAS data is out I'll plot July's losses on this graph.